Maggie Joan’s authentic Mediterranean offerings are as unique as her location. 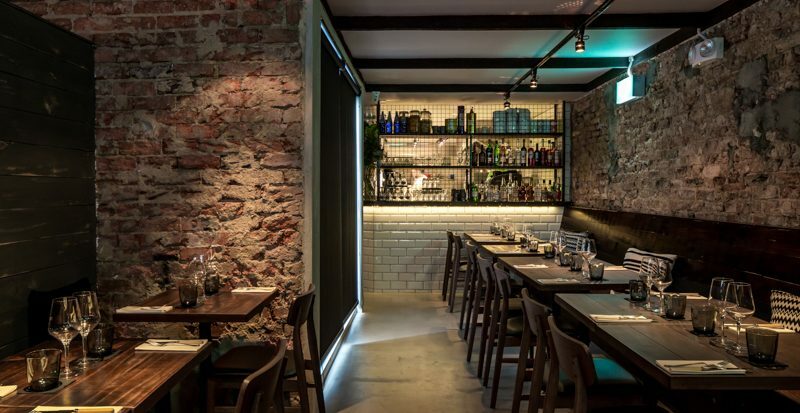 Tucked at the alleyways of Amoy Street and at the cul-de-sac of Gemmill Lane, she mimics a quaint little restaurant that you would only stumble upon when wandering off the beaten track in Greece. Maggie Joan’s is yet another brainchild of Chef Daniel Ballis (of Moosehead’s fame) and manned by Chef Oliver. Maggie Joan’s sets herself apart from the street food concept of Moosehead; the food here is artisanal and hearty and the decor setting is more rustic yet homely. I had the pleasure of trying her newest lunch menu and it was unforgettable! Maggie Joan’s made me fall in love with her at first bite. The appetiser, in the form of Cheese Arancini and Tomato Chutney ($9), is warm, comforting and yet stirring to your senses. 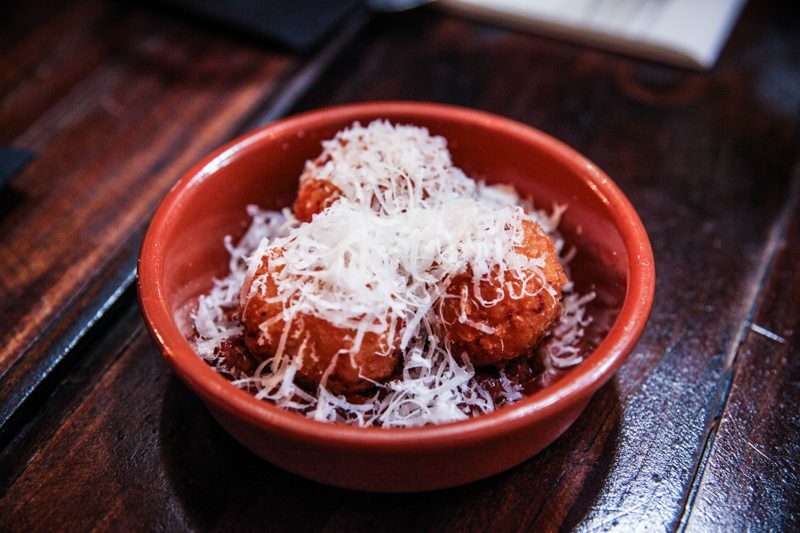 Arancini are essentially rice balls with typically cheese fillings that have been fried to golden brown. Chef Oliver adds his touch by setting the arancini upon a bed of sweet tomato chutney. Take a bite into it and it will reveal its delectable cheesed rice filling. Spread that chutney onto it and take another bite, and your soul will surrender to Maggie Joan. If you have some remnant chutney, dip it with the homemade sour dough. You’d never want to leave this restaurant. Feeding hungry people at Maggie Joan’s is pretty easy. Just order another appetiser! 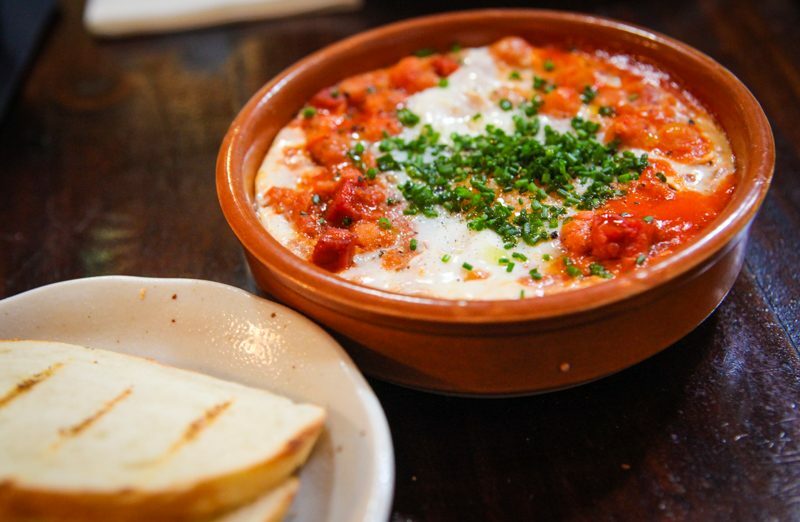 May I suggest the Gypsy Styled Baked Egg ($16) which is a Spanish spiced chickpea stew with Iberico chorizo that is smothered with baked egg and sprinkles of preserved lemon pulp. Served with toasted sourdough bread that is still warm from the oven, a generous spread of the chickpea stew on it is all you need to get the juices flowing. 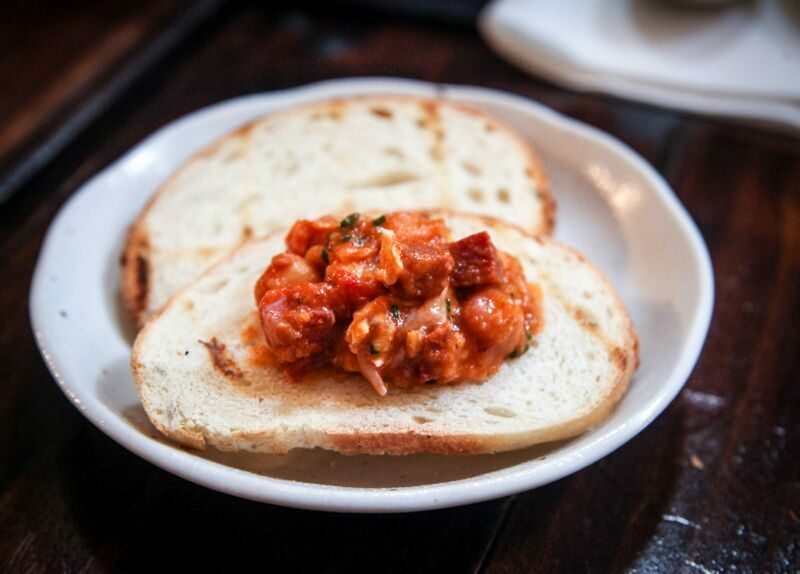 It doesn’t hurt to just indulge on a few more of the chorizo cubes, too! 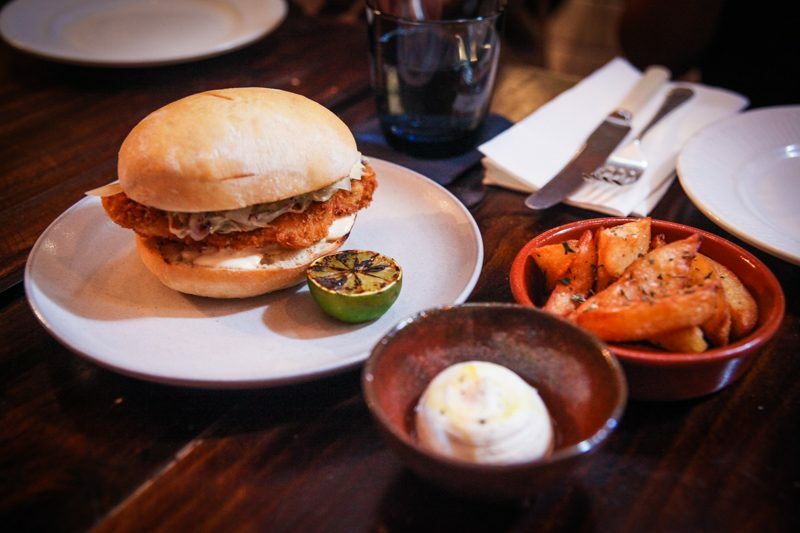 Let me tell you this – Maggie Joan’s offerings are pretty hearty. I’d implore you to share with your mates, even though you’d find it hard to resist NOT to share. 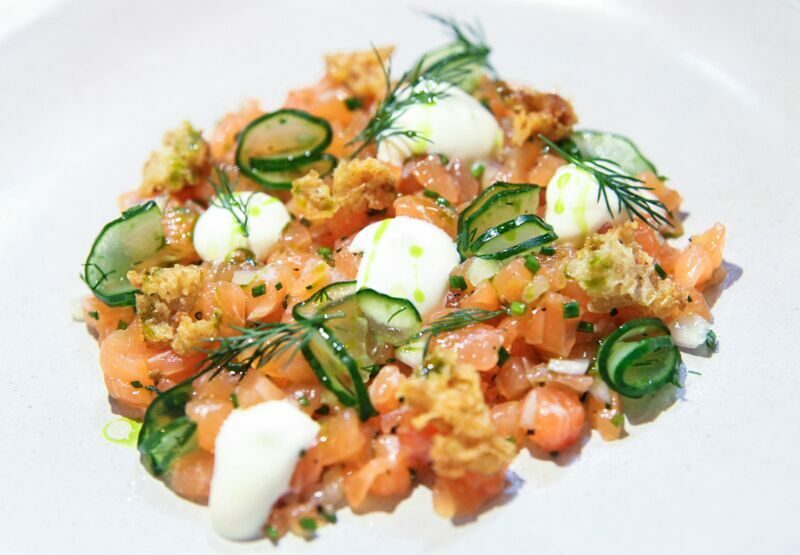 I have three recommendations for your mains, and I will start from the lightest one – the Cured Salmon Tartare with Dill, Cucumber and Yoghurt ($17). This is unlike any other tartare that I have tried, so far – the combination of tastes and texture is the one that captured my attention. Scoop up a spoonful of that tender salmon tartare along with dill and cucumber, and you MUST include the sour dough crouton. Only then, you get the full Monty of what Chef Oliver wants you to experience. The next couple mains may divide diners into either the poultry camp or the pasta camp. I bet neither camp will leave disappointed. For those who are on the poultry camp, you will surely be delighted with the Fried Chicken Sandwich with Green Harissa Coleslaw and Pecorino ($18). Chef Oliver, being the OCD (Obsessive Compulsive Dude) cook that he is, insisted that only poulet jaune (yellow chicken) be used for this dish, and it has to be crusted with panko and deep fried to perfection. At first bite, you will surely get the spicy taste of the green harissa coleslaw. Wring out all the juice from the burnt lime to add another acidic dimension to this whirlwind of a sandwich. In my past life, I was surely an Italian – I am always inexplicably drawn to pasta. 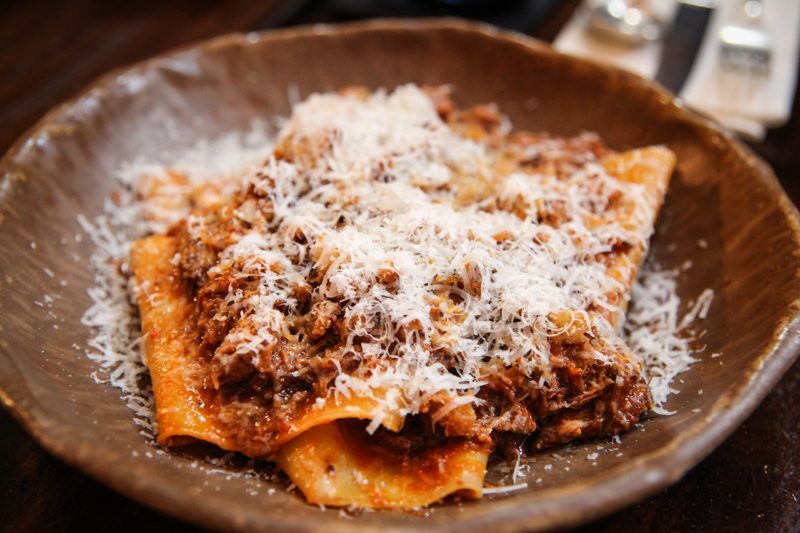 Maggie Joan’s Homemade Pappardelle in 12-hour-Roasted Lamb Shoulder Ragu and Parmigiano Reggiano ($26). It is as much of a mouthful in name as this hearty pasta! This one is truly for the hungry because its portion is pretty generous. Our OCD Chef Oliver roasts this lamb meticulously overnight and then caramelises it the next morning. The al dente parpadelle is made in-house, and tossed with chilli paste – you will get a gentle hint of spiciness. And I love how the sourdough croutons have been embedded with parmigiano reggiano cheese, which elevates this dish with textures of crunchiness. Now, do you still have space in your tummy for dessert? Desserts at Maggie Joan’s changes daily. 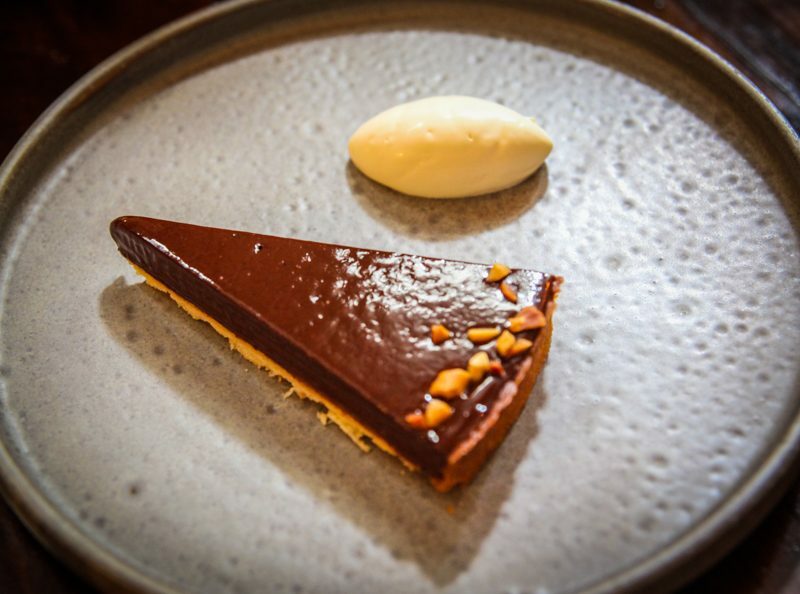 I had the pleasure of getting to taste the Dessert of the Day, which was Dark Chocolate Tart ($10), made with 65% dark chocolate ganache. So, there you go – here is my account of my love affair with Maggie Joan’s. 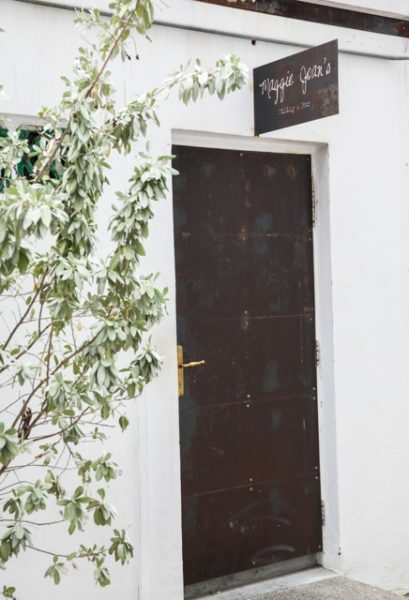 Finding her may not be that easy, but the entrance to her heart is through Gemmill Lane, off Club Street – and look for the door that you see in the photo above. Be careful, she might put a spell on you, like how she did with me. Maggie Joan’s Dining & Bar | 110 Amoy Street, #01-01 (Entrance from Gemmill Lane) 068579 Singapore | Telephone: 62215564 | www.maggiejoans.com | Opening hours from Monday to Friday: 12 noon – 230pm; 6pm – 11pm; Saturday 6pm – 11pm; Closed on Sundays. A healer and journeyman who loves the beauty of life. Most of the time, he is a charming, up-and-coming aesthetic doctor; and in his free time, he is a food writer and an amateur photographer.